I saw an artist this weekend I interviewed a couple of years ago. We exchanged a few small words and then, wanting to connect in a more meaningful way, I caught his eyes with mine and asked, “Are you well?” “Yes, yes, just spread a little thin,” he responded. 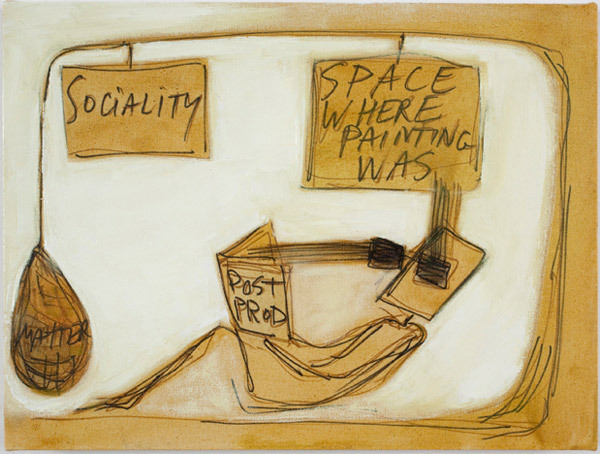 Mira Schor, The Space Where Painting Was, 2010. Ink, pen, and oil on white linen, 12″x16″. Courtesy the artist. Ah, yes, THIN – that’s the way it is now. THIN: too little butter for the baguette, pastry dough rolled so it breaks into holes, a string pulled taught till it snaps, resources that do not match the needs. In that sliver of THINness, we shared a common awareness of what it takes to survive, let alone uphold one’s beliefs. Last week, with an estimated 6,000 attendees, the College Art Association held its 101st annual conference in New York City, organizing 200 panels and a wide range of exhibition, reception, and tour events across four days. Robert Storr was the keynote speaker and T.J. Clark, Hal Foster, Claire Bishop, Harmony Hammond, Martha Rosler and Ellsworth Kelly were some of the award recipients. Conference fees were high: on-site registration costs ranged from $175 for student members to $550 for nonmembers; add to that travel, hotel, and meal expenses for out-of-town participants and the budget grows. While members with full time institutional affiliations have their expenses reimbursed as professional development costs, many artists and scholars attend this conference at their own expense for research and networking. Artist Anthea Black revealed in a panel discussion on the artist as arbiter that the average annual income of Canadian artists in spite of the nation’s generous funding practices, is about $15,000 (close to minimum wage in the US). Artist Mira Schor, honored in the Annual Distinguished Artist Interviews, shapes and polishes a multi-faceted living: as co-editor of the magazine M/E/A/N/I/N/G, she also writes, teaches and paints. The women were two of many high-functioning participants of ARTspace, a conference within a conference that offered – free and open to the public – panels, discussions, and mentor exchanges organized by Sharon Louden and the Services to Artists Committee. “What we want is free” was the catch phrase of the artist arbiters, meaning that human contact and community exchange can and should be a priority when thinking about the significance of cultural production. The Ladies Invitational Deadbeat Society (LIDS) of Canada produced a banner whose words could be read either: DO LESS WITH MORE or DO MORE WITH LESS depending on your inclination. The financial boom of the 1990s showed signs of breaking at multiple points but everyone admits 2008 was the definitive end of upwardly mobile incomes for artists. Even Robert Storr, former senior curator of the Museum of Modern Art and current dean of the Yale University School of Art, forecast a bleak future in his keynote address, suggesting the art world, as it has been, no longer exists and will have to be reconfigured. Mira Schor, Modest Painting, 2000. Ink and gesso on linen, 12″ x 16″. Courtesy the artist. 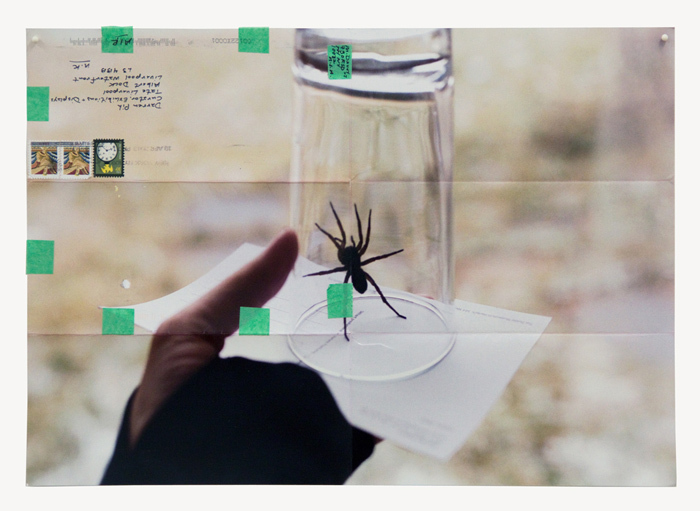 Collaboration, multi-tasking, and systems of barter-exchange, were key tactics for survival presented by artists. In the panel “How to make a living as an artist,” Sharon Louden spoke of “sustaining a creative life.” Whether gallery director, writer, or artist, many insisted on the necessity of more than one income with more profitable sources sustaining riskier ones. Adaptability, innovation, and openness were considered useful qualities. Matthew Deleget, artist and co-founder of Minus Space, a gallery focused on conceptual abstraction, said that the degree of success depends on an uncompromising worldview. “It begins with the work but doesn’t end there,” he stated adding, “As catalysts, artists are social capital.” Throughout the ARTspace events, emphasis was on action rather than economics: how do you define “success”? Being visible and engaged in community was rated as high as the quality of artwork and more significant than the status of the artist. You have to be realistic, maintaining a practice in spite of the ebbs and flows of the market or the trends of international biennials. 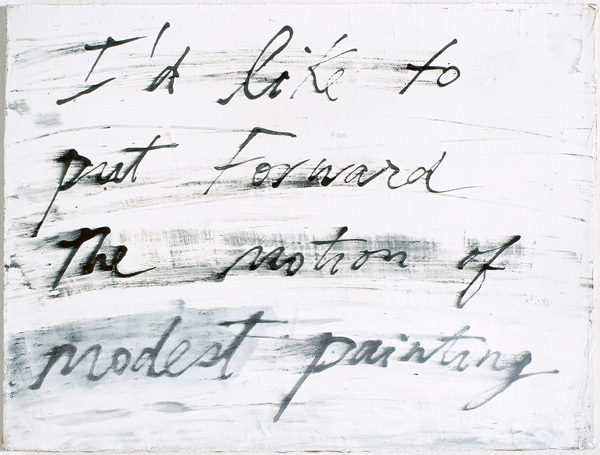 To read the painted text as “Forward the motion…” opens the interstices of expectation to radical possibility. When spread THIN, make a modest motion forward and put forward the motion to sustain art and life. [*] Mira Schor, “Modest Painting” in Art Issues (January-February 2001): 18-21.